Cook Your Life is the right place for you. 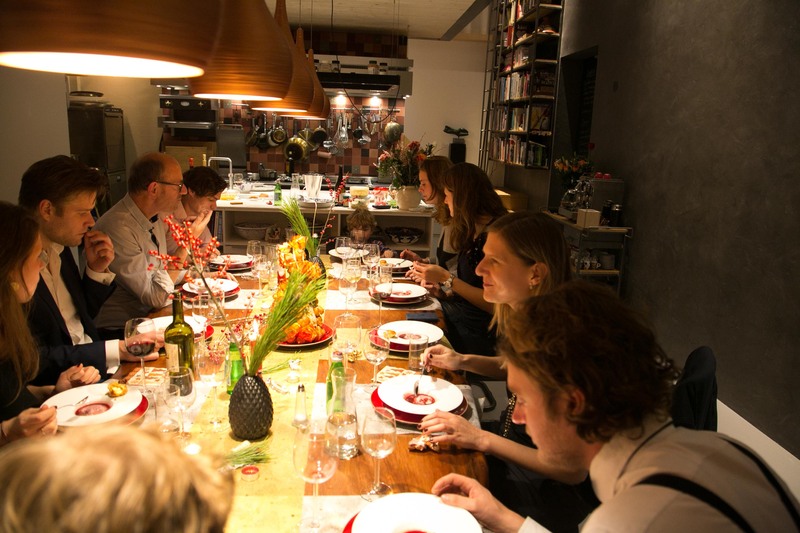 The cooking studio is ideal for celebrating life with your own company. It is like you are seated in a private restaurant with an open kitchen where you see me preparing your seven-course menu. In the meantime, you and your party can completely relax while the dishes appear on the table. The menu will be set in tune according to your wishes or theme. All year round upon request. In the Cook Your Life cooking studio (max. 16 persons) or at a specific location. From €85 per person, excluding wine arrangements. Of course, we can discuss special wishes or a particular theme. The Cook Your Life cooking studio is fit to hold you and your party in order to celebrate life while you enjoy a seven-course menu. I prepare a lunch or dinner exclusively for your company and will serve it to you in an extraordinary private setting. The menu will be set in tune according to your wishes or theme. In short, enjoy private dining by eating together at a 28,000-year-old Kauri table and enjoying the view of the canal in front of the door. Cook Your Life is located in a fantastic place near the port. Do you prefer to lunch or dine at a location of your own choice while a real chef prepares the food? If this is the case, we will prepare all the dishes beforehand and will bring cooking equipment, tableware, cutlery, table linen and glassware along so that we can present and serve the dishes on site. Of course, we also take our own atmosphere and energy with us to ensure you it will be an unforgettable afternoon or evening.